Click on any of the images to enlarge it. These two comic book advertisements were a gift from Masimilliano Marriotti (Miano) of Rome Italy. 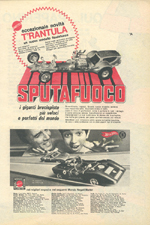 The advertisements announced the Gran Toros line in Italy where the Gran Toros were released under the "Sputafuoco" name. I've provided translations for each with the original Italian in red text and the US English in black text. il nuovo concetto di "corsa" creato da Mebetoys e BruciaPista. the new racing concept created by Mebetoys and Hot Wheels. Le nuove grandi macchine Mebetoys le fantastiche ruote delle bruciapista le piste piú larghe del mondo. The new big machines made by Mebetoys the fantastic wheels of Hot Wheels the biggest tracks in the whole world. Sputafuoco, i giganti-bruciapista piú veloci e perfetti del mondo. Spitfire, the giant Hot Wheels, the fastest and most perfect in the world. Ragazzi! Finalmente papà è d'accordo. Sputafuoco è un' irresistibile novità! Due splendidi modelli; Ferrari Can-Am e Astro Chevy. Piste per alte velocità con partenza e traguardo. Ed ora entrate anche voi nella scuderia dei piloti piú veloci del mondo! Sputafuoco, i bruciapista in "formato gigante" in tre diversi tipi: Record Mondiale, per km lanciato_____ Doppio Sprint, doppio pista per gare ______ Gran Prix, per grande corsa al brivido. (i modelli Sputafuoco funzionano senza electtricità e batteria). Sputafuoco, i formidabili superbolidi-bruciapista. Kids! Finally your Papa agrees. Sputafuoco is an irresistible toy. Two splendid models; Ferrari Can-Am and Chevy Astro. Track for other racers with starting and finish gates. And now you too can enter the race with the fastest drivers in the world! Sputafuoco, the Hot Wheels made giant size in three different sets; Worldwide Record, for km time-trial______ Double Sprint, two tracks for a match _______ Gran Prix, for big race excitement. (The Sputafuoco models function without electricity or batteries). Sputafuoco, the formidable super racers. Novità. riservato ai ragazzi piú veloci del mondo. New. reserved for the fastest kids in the world. eccezionale novità T'RANTULA UN nouvo modello Sputafuoco. exceptional new T'Rantula. a new Sputafuoco model. Luci anteriori. Simulatori DI direzione. Muso a mandibole DI tarantola. Motore cromato, 7500 cc. Sedile super anatomico avvolgente. Apertura DI emergenza sul tetto. Cuscinette scorrevolissimi. Calcomania DI ragnatela. Alloggio per paracadute frenante. Front lights. Simulate direction. The mouth and mandibles of a tarantula. Chrome motor, 7500 cc. Super anatomical wraparound seat. Emergency escape hatch. Very smooth bearings. Tarantula web. Place for braking parachute. i gigante bruciapista piú veloci e perfetti del mondo. The giant Hot Wheels the fastest and most perfect in the world. Straordinario, ragazzi. Questo nuovo modello sembra una macchina vera. Guardate come è bello, come è ricco DI particolari, come è perfetto in tutti i dettagli, e come sfreccia veloce. Sputafuoco è UN superbolide meraviglioso! Le sue ruote sono le stesse del bruciapista, ma molto pui grandi, per poter correre ancora piú veloce. Extraordinary kids. This new model looks like the real thing. Look how beautiful it is, rich with features, how perfect in every detail, and how fast it runs. 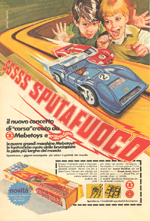 Sputafuoco, is a marvelous super racer The wheels are the same as the Hot Wheels but bigger so it can run even faster. Attenzione: puoi comprare subito questa bellissima macchina DA sola o nella confezione le piste giganti tipo bruciapista. Attention: you can buy these beautiful machines right away, either by itself or with the race track. nei migliori negozi e nei seguenti Mondo Regali Mattel. In the best stores as follows, the World King Mattel.